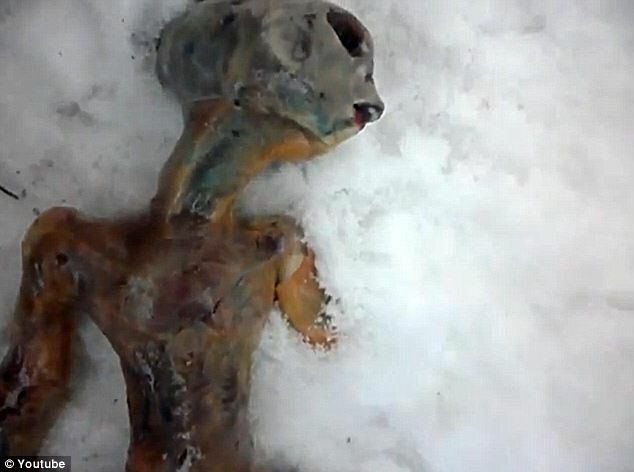 It may just be an elaborate hoax, but a video has surfaced showing the body of an alien found dead in snow in Siberia. The video, posted on April 17 on YouTube, has already had over 100,000 views and showed the body of the unidentified "creature". Irkutsk, Russia is apparently a known UFO hotspot, and UFO believers think the body was left behind by alien visitors after an accident, or was missed in a clean-up by the Russian government as part of some sort of alien cover-up. Dozens of UFO sightings are reported every year in the area, and only last month there were reports of an unidentified object hurtling into the nearby Irkutsk region of Siberia. "We couldn't believe it when we saw it. And what was spooky is that there was no sign of the spaceship. Perhaps that was taken away and the body overlooked," said Igor Molovic, one of the pair that uploaded the video. However, not everyone is a true believer. Some believe it is actually a carefully crafted model of an alien's body, and not the real deal. However, many UFO lovers still believe. "It's so lame how people always get thrilled by having another excuse to shout 'Fake! fake!' every time something weird shows up. Unless proven otherwise, this is in fact plausible," posted one user. Another said; "If this is fake - then they are masters at models/puppets. I think it's real - one of the very few, great vid."